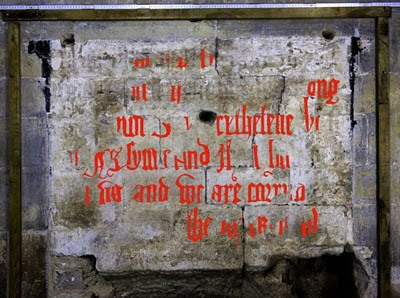 Via Medieval News, an enhanced image of some writing recently discovered on a Salisbury Cathedral wall. The words are in English, but what they are and what they mean is a mystery. I know what you are thinking: I scribbled it there when I was at Salisbury in 2007 -- you know, when my family dined upon scones with Jude Law. Well it wasn't me: the text is fifteenth century. "Hahaha you thought you got rid of us in 1290, we are sneaking through your cathedrals and scoffing scones in your cafés"
"PLEASE refrain from carrying baked goods from the refectory into the main cathedral." "Shrine temporarily removed to make way for the Reformation." I got nothing. Everyone's already seen the "and we are c..." on the penultimate line: I'm guessing it doesn't say "and we are coming to get you, Barbara." But is that "asylum" in the line previous? Or am I straining?